Trump’s win marked the end of one of the most divisive elections of our time. Characterized by vitriol, mudslinging and conspiracy theories, the race revealed fundamental disagreements about what direction the country should move in — both between and within parties, as the hotly contested primaries demonstrated. Having served as secretary of state, U.S. senator and first lady, Hillary Clinton was touted during her campaign as being uniquely prepared for the presidency, whereas Trump ran on the promise of being an outsider. At an impromptu “F*ck Trump” rally in White Plaza, students voiced their frustration and uncertainty as to the future of the country (SAM GIRVIN/The Stanford Daily). Under the slogan “Stronger Together,” Clinton pushed a message of unity in the face of uncertain socioeconomic circumstances. Trump was characterized as a reactionary who had done much to alienate large subsets of the population. Throughout the race, the Republican candidate overcame bitter criticisms of his inflammatory and often deceitful language, allegations of sexism and racism, tax scandals and nebulous policy positions; he now faces the task of uniting a country that for the last year has been embattled in heated rhetoric and a deep partisan rift. In asking for the country to unite following the election, Trump also made a promise. “I pledge to every citizen of our land that I will be president for all Americans, and this is so important to me,” Trump said in his acceptance speech in New York. 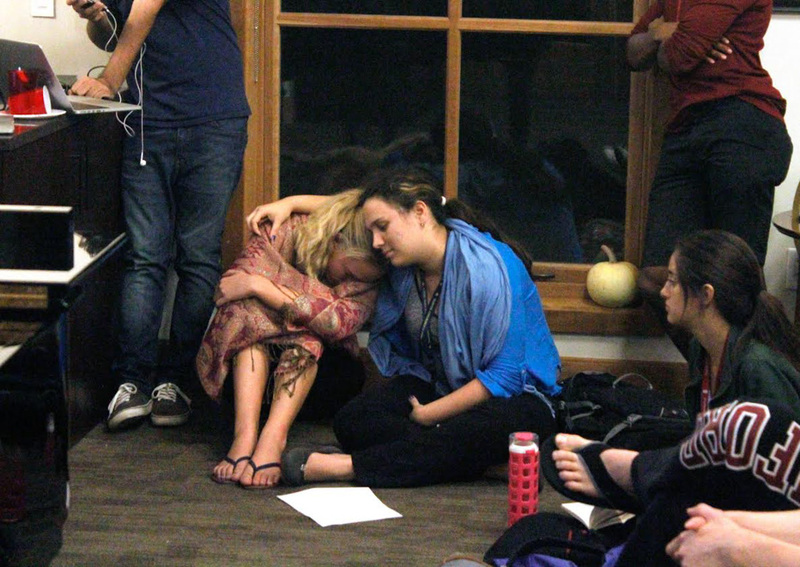 Across campus, watch events were characterized by subdued moods and the exhaustion of a long election season. As early election results came in from the East Coast, a sense of anxiety or hope made it difficult for some classes convening during the day to focus. One professor called for her class to refrain from checking the news so they could concentrate on 1940s Japanese history for an hour. “There might even be some lessons to be drawn from today’s lecture, like what right-wing nationalism and racism can do to a country,” she joked. Reactions ranged from denial to indignation to restrained optimism as polls closed and the odds shifted dramatically in Trump’s favor. Over 400 students gathered in White Plaza just after 10 p.m. for an anti-Trump rally, joining to voice their frustration at the election of a man who throughout the race consistently pushed the limits of what was acceptable for a presidential candidate to say and do. 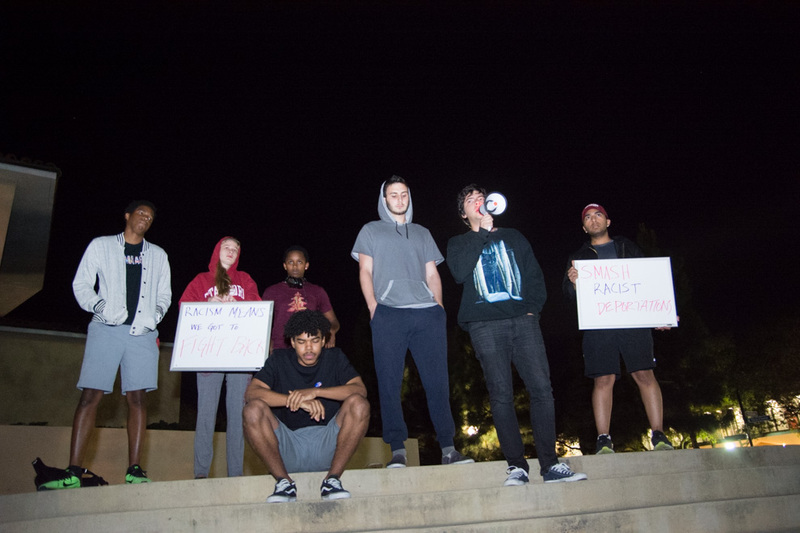 At the rally, students and community members took turns with a megaphone, sharing their fears on the direction of policy and on an environment of xenophobia and bigotry under a likely Trump presidency. One student, a Muslim, lamented how he would be treated in a country that voted in favor of a man who at one point suggested instituting a national registry of Muslim residents. Others voiced anger that the progress in marriage equality, healthcare and social justice made during the last eight years would be unraveled. Romeo Umaña ’19, whose mother is an undocumented immigrant, grappled with the uncertainty of his family’s and the country’s future. 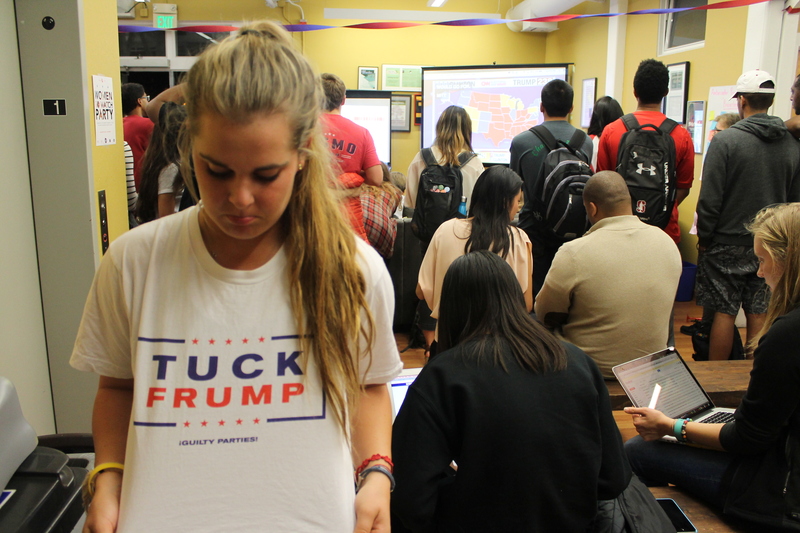 Viewers of the SIG watch party at Ng House were emotional after it became clear that Trump would win the presidency (MICHAEL SPENCER/The Stanford Daily). Though the rally’s organizers, several freshmen from Ujamaa, emphasized from the start that the meetup was entirely nonviolent and meant as only a forum for students to speak their minds, several security guards circled the crowd. Provost John Etchemendy addressed the gathered community early on. Students discussed not only their frustrations and anger, but also the necessity of a path forward. One speaker compared Trump’s upset win to the Brexit vote, which liberals also did not believe would come to pass. Others called for renewed activism and efforts to connect to the poor white working class, which formed an important voter base for Trump. The businessman and reality television star’s upsurge stunned students and pollsters alike, who up until the morning of the election had predicted a routing by Clinton. However, as results came in from battleground states, Trump surged ahead for decisive leads in Ohio, Florida, Michigan and, eventually, Pennsylvania. At a 150-person watch party at Ng House hosted by Stanford in Government (SIG), what began as excitement at the prospect of the first female president devolved into nervousness and then anguish. 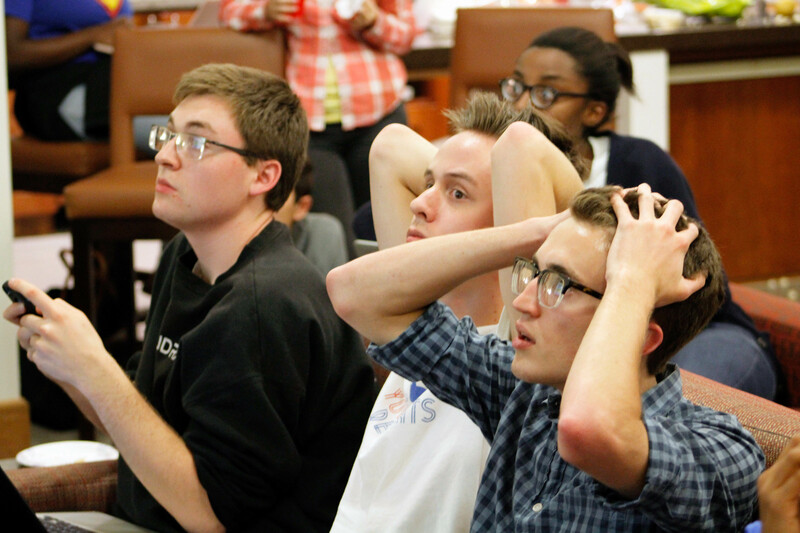 Viewers at Ng House watch as key states are called (MICHAEL SPENCER/The Stanford Daily). Scholz also said that she is looking forward to continuing to connect Stanford students with public service and policy opportunities. “Our nation needs Stanford students to step up as leaders of the future,” she added. At the “Women to Watch” viewing party, students of all genders crammed into the Women’s Community Center, with many holding out hope even late into the night. When California was called for Clinton, supporters gave a hearty cheer despite the New York Times prediction nearing 90-percent likelihood of a Trump victory. Several students expressed confusion about how to proceed in anticipation of a Trump presidency. “For a long time, I didn’t contemplate the actual possibility of this happening, and now I’m trying to figure out what [a Trump presidency] actually will even look like,” Zoe Savellos ’18 said. At the Stanford College Republicans watching event in Lantana, meanwhile, just 13 students gathered, somewhat subdued yet still upbeat. One “Make America Great Again” hat stood out among khaki pants and collared shirts. 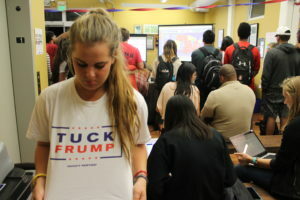 “I don’t think anyone expected Trump to win this evening,” said Elise Kostial ’18, president of the Stanford College Republicans. The group itself can’t endorse candidates, and so Kostial declined to share her personal views. The other attendees also declined to offer comment. From Stanford in Washington, students working and studying in the nation’s capital stayed up until Clinton’s concession call at 3 a.m. EST. A Daily survey last week showed that 84.7 percent of Stanford students supported Hillary Clinton, while only 3.9 percent backed Trump (ANDREW SOLANO/The Stanford Daily). As news media outlets began to call the election, screams rang out on main campus. In his victory speech, Trump congratulated Clinton on a hard-fought campaign and acknowledged her civic contributions. “Hillary has worked very long and very hard over a long period of time, and we owe her a major debt of gratitude for her service to our country,” he said. For students, however, 84.7 percent of whom supported Hillary and only 3.9 percent of whom supported Trump, the result on Tuesday was nothing less than a bitter disappointment. For many, it was a devaluation of their identities as Americans with a claim to their country equal to that of anyone else. “I don’t feel like an American right now,” Hannah Llorin ’18 said. Courtney Douglas, Miguel Samano, Andrew Solano, Michael Spencer and Tristan Vanech contributed to this report. Contact Victor Xu at vxu ‘at’ stanford.edu and Ada Statler-Throckmorton at adastat ‘at’ stanford.edu.